That’s what my spouse has been telling members of our family. That’s what I’ve been telling friends from grade school to my work friends. Well, as it turns out, I am not ready to finish that sentence any other way when I meet with my new bosses and colleagues and HR people next week. I’ve been told at the end of my first six months of my new staff job at a New York based TV network, that I will be re-evaluated. I worry that if I “come out” at work, that I could be (unfairly) judged not on my work performance but on how people feel about my gender status. Yeah, I know: it’s illegal. Yeah, I know: I can challenge it, in court or with the Equal Opportunity Commission. I have three children to support and I don’t have time to wage a battle without an income to feed them, clothe them and provide them with a roof over their heads. So… if all goes as it should, I’ll finish that sentence in six months honestly. I have waited, and can wait a little longer. What I could no longer wait to do, however, is far more serious, far more depressing than anything that’s happened to me since the close call I survived in saving my marriage. I’ll explain in a moment, but first, I want to say for the record, my wife and I are still together, still close, and still working toward our own creative solution. I’m maintaining my male identity, while not denying to her or to myself my status as a transgender person. I found a very specific description for that status: non-op, meaning a transgender person who does not plan to have surgery to become a transsexual and transition full-time to another gender, in my case: male to female. For right now, that’s not in the works, on the calendar or part of the plan. I am doing everything I can to be the husband and the man and the father without denying my condition. What my wife has done to give us a chance is talk with spouses of transgender friends, talk with her closest relatives about our relationship, and talked openly with me about her feelings, her concerns and her fears. She’s done research and given my condition far more thought than I am admittedly putting in right now. What I’ve done is send away the clothes, the shoes, the trappings. I purged myself of the majority of the things that were for me my ticket to looking, feeling and being myself. I allowed myself one last visit to the dentist before telling my lovely dentist and her staff that I had made a promise to my wife to express myself as male, 24-7, until I could no longer do it. And that promise comes with another promise, that I would tell her if I could not keep my promise. What I know with certainty is that informing her I broke my promise would be the sign she is waiting for that I cannot live as her husband and must transition. She strongly believes that now: that there is no other cure for my condition than transition. She also believes me when I say transition to me is not as important as being with her and our children. Would I prefer to have my cake and eat it, too? Sure. But I know that it is one or the other. Either way, we know now that our separation or our continued marriage will be without the acrimony of the recent past. We will be friends forever. But I am not satisfied that putting myself first is the best solution, and for my own selfish reasons, I want my best friend to be my wife and my wife to be my best friend. And I want to live in the same home as our children, and be there for them as an active parent, not someone who shares custody or is granted visitation. Those things are more important to me than transition. I guess we’ll see who’s right. My wife knows from my transgender friends and from their spouses that “the genie cannot go back into the bottle.” I say, for now, this works for me, I know it’s working for her, and so far, that is all that matters. Our family is whole. So (finally) , that brings me back to the thing that has rocked my world. It involves my original family, of which my mother and sister are all that’s left. My mother is remarried since the death of my father, and my sister and I were never closer in all our years, up until Friday. She has only recently rekindled a relationship with our mother, after years of not talking, and years of acrimony. It made me so happy that these two women were finally talking and finally reconnecting. But something was still amiss. The closer my sister grew to my mother, the further my mother and I grew apart. My wife described it as if she only had room in her heart to love one of us at a time. I don’t disagree. We have a contentious relationship, and part of that is over what she did in our past, part is over her perception that I am ungrateful, selfish, rude and disrespectful. Well, I think I’ve finally given her reason to think those are all true. And then I said it again, louder. A third time, still louder. Not sure if there was a fourth time, I lost count. But they were all loud enough to attact attention. Oh, and then we all posed for pictures with big, phony smiles. 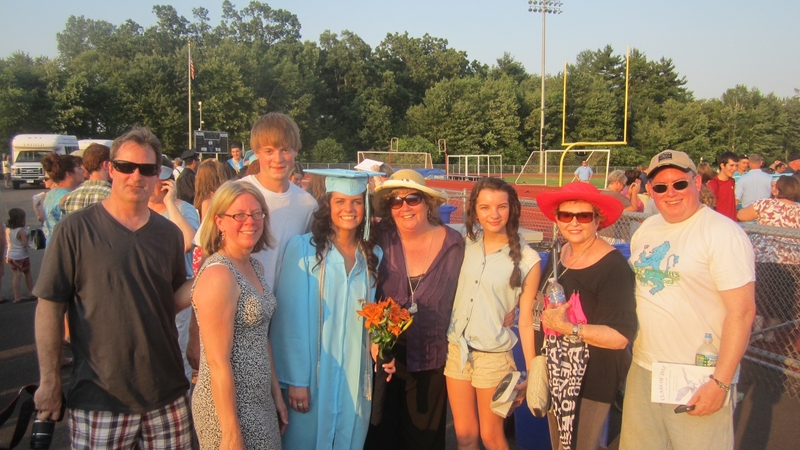 I neglected to mention this public event was the graduation of her first grandchild, my niece and goddaughter. I think I also proved I need to work on my sense of propriety and self-awareness. Why on earth would anyone say something like that to their mother, over and over, in public, and embarrass her, myself and of course, my sister and the graduate? What could have driven me to show such utter disrespect to the woman who brought me into this world and has been such an influence on my life? Those are questions for another post. Suffice to say: I apologized, in writing. I confessed my sin, in person. And I have separated myself from my mother, ultimately, finally and without reservation. There will be no reconciliation, not unless she seeks it out. I expect we shall remain separate, sad and sorry until death do us part. Which is an odd phrase to use, since it’s from a marriage vow. But for all intents and purposes, what I declared that day in the rudest, most inappropriate way, was my intention to divorce her. I cannot say it feels good. Let’s just say, it feels better. I admire you for taking careful stock of where you are in your relationship with your wife and your family situation, and adjusting your course accordingly. I can’t help but wonder if seeing the pain from others (including myself) who have been more tunnel-visioned about things has encouraged you to tread more carefully than we (I) did. I don’t know. All I know is that I hope you are able to maintain a balance that works for you and your wife. I truly do. No one should feel what this feels like to have the person you believe to be your soul mate ripped out of your life – and realize you were the one doing the ripping. If I try to picture hell, this is it. So, keep it up! As for your mom, what a difficult place to be. No, you don’t sound like you were in good control of your own behavior during the event you described, but we do all have a breaking point. Distance sounds wise. Maybe she will surprise you one day, but assuming she will not is probably smart just for your own sanity’s sake. It is no accident that I am treading carefully instead of headlong (as I would typically do). I can say with certainty that you among others have influenced my newfound degree of caution, but I’ve also mellowed a bit and learned through getting burned over and over (and over) that running where angels fear to tread just gives one singed wings instead of the heaven we seek. My wife and I had this discussion yesterday and again last night, underlining the question: are we fooling ourselves? I want to transition but not at any expense. Losing my life with my wife and with my kids is (for me, and for me alone) too high a price. That’s not to say I don’t envy you in other ways, or think poorly of your decision. If anything I think you are courageous, inspiring and give me reason to hope that if it happens to me, I’d pass half as well as you already do. As for my Mom, well like I said, that’s for another post… I have no arguments with anything you said. I commend you for your decision not to transition and my heart goes out to you as well as I know the position you are in. My own wife would have loved it if I did not transition but once I knew how it felt to be my true self, there was no going back. Indeed the genie had gotten out of the bottle and was not about to go back in. We ate still together and are best friends but I don’t know if that will be enough to keep us together in the long term. I hope so, but we are still adjusting and I need to be patient. One key difference between us is that my kids are grown and amazingly, have accepted me. We are also older, both being 57, and the world looks a little different than I did when we were younger. Different things become important. As far as your mom goes, wow….. blame it on the hormones. I told my mom, who continues to interact with me but has not acknowldege what I have told her. We have not told my dad as we (mom, sister and brother) believe it could kill him, litterally. He is 82 and already not in good health. I don’t really know you but if you are truly TS then you will go through much turmoil. Maybe not forca while, but eventually. I know what purging is, most of us do. I’ve purged and promised more times than I can count but my feelings always came back until I could deny myself no more. Maybe it will be different for you. Right now you remain the proverbeal “knight in shinnng armour”. Ride on Dawn. Ride on….. Thank you, Laura! It’s a daily struggle. I would say I’ve committed to being non-op, but I’ve not given up on transition /- I just slowed down so as not to rock the boat anymore than I have!